I hate zucchini. I will literally only eat it if it’s shredded and put into a cookie, like Coconut Oil Double Chocolate Zucchini Cookies. So, while staying at a friend’s house, my friend’s mom made breaded zucchini chips and asked if I wanted any. I just sort of looked at them and was like oh, what the heck. They’re breaded in carbs so maybe they will taste better. Well, wasn’t I pleasantly surprised! These have become one of my favorite side dishes and I even make them now when I want a healthier snack. These breaded zucchini chips are great by themselves, or my favorite way to serve them, is over a hot plate of spaghetti with marinara sauce. These breaded zucchini chips go great with a lot of different dishes, especially those that are pasta based. I like to serve these over a plate of spaghetti with marinara sauce. In a small bowl, whisk one egg (you might end up needing two, but start off with one). In a another small bowl, measure out 1/2 cup bread crumbs (you might end up needing more, but I would start with 1/2 cup). Take a zucchini slice, coat with the egg mixture by dipping it in. Take the egg coated zucchini slice and press each side down face first into the homemade shake and bake mixture. Place coated zucchini slice on baking sheet. Repeat steps 5-7 for remaining zucchini slices. 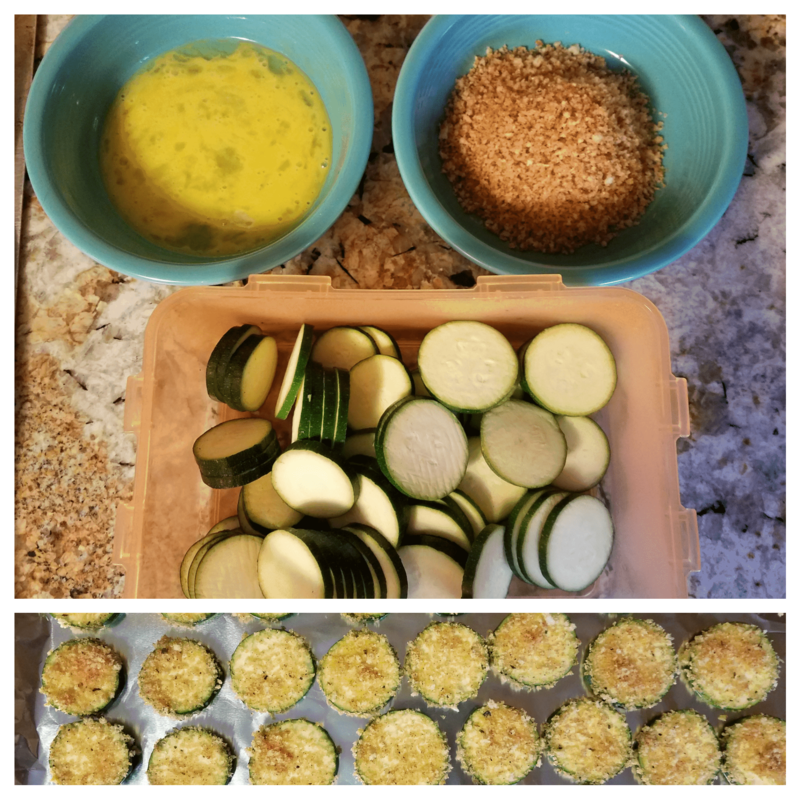 Bake for 30 minutes, or until zucchini chips are crispy. For even crispier slices, I like to turn the oven off after 30 minutes and then leave the zucchini slices in the oven for another hour. 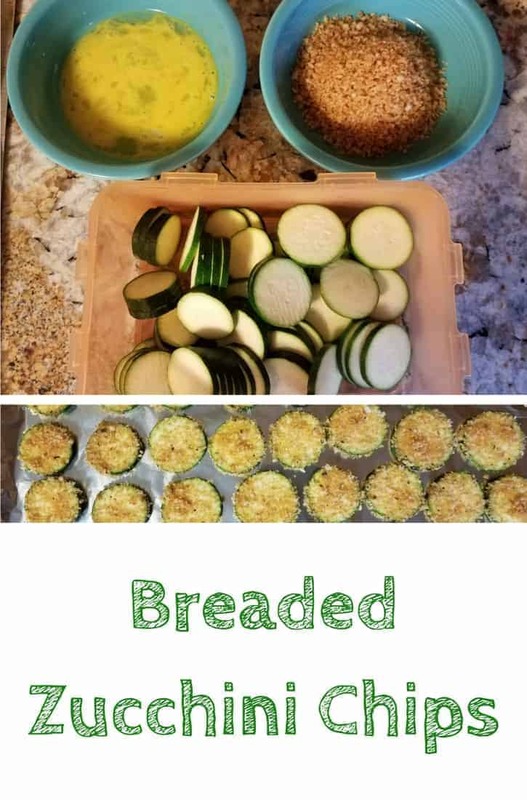 To speed things along, you can place multiple zucchini slices into the egg mixture, and then only press one side into the bread crumb mixture. Yummy! I discovered zucchini pizza a few summers ago and it’s one of my favorite things to make. I love making things with zucchini because it’s so good for you. My mum is going to loveeeeeeeeeeeeeeeeeeeeeeeeeeeeeeeeeeeeeeeeeeeee this!! She absolutely loves zucchini and this looks so delicious too!! Great work! Mmmm these sound so good, I bet they taste amazing! I love making things like this. As a veggie I love to find different ways to work with veg. I haven’t had zuchini before but it looks delicious when in the form of breaded zuchini chips. Anyway, It’s nice to see that you can now take zuchini when prepared that way. Problem solved lol! I have never made anything like that at home. I love getting them when I go out to restaurants. I will have to try this out at home as I’m sure I would love it. I love the sound of this recipe. It looks very tasty. I bet my kids would this. Will try it.